To cut any shape out of sheet metal, you need to know the length of all the sides, and trace the sides onto the sheet metal so you can cut them. This is easy when you are dealing with shapes like squares and rectangles where the sides are obvious, but it gets a little tougher when dealing with a cone. 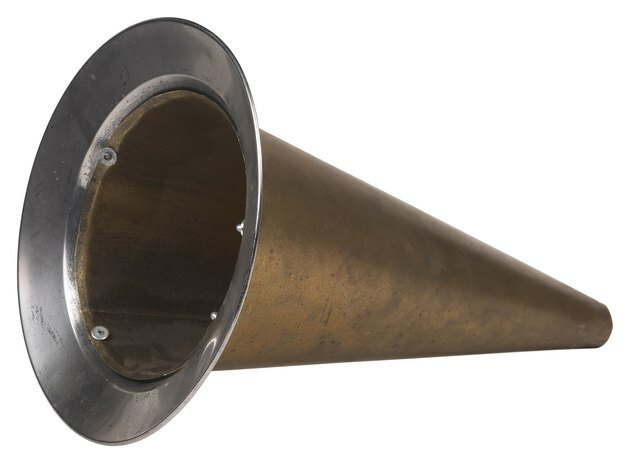 The cone has a diameter at the top smaller than the diameter at the bottom, and to accurately trace the shape onto sheet metal, you need to make a template out of construction paper. Lay out a cone onto sheet metal. Lie your cone in the middle of a piece of construction paper, with the top of the cone at the top of the paper. Make a mark on the paper at the bottom of the cone. Remove the cone from the paper and cut the bottom of the construction paper off at the mark that represents the bottom of the cone. This cut is a straight line. You now have a piece of construction paper the same height as your cone. Make a straight line on the cone from the top to the bottom. Place the cone back onto the construction paper, with the line you drew facing up. Wrap the paper around the cone. With a pencil, make a line from the top of the cone to the bottom, on the construction paper where the paper overlaps the line on the cone. There is now a line on the right and left sides of the paper. Unwrap the paper from the cone and cut the paper along the lines you just drew. When you are done, the construction paper is the shape of a fan, smaller on the top and larger on the bottom. Lie the piece of construction paper onto the piece of sheet metal, and trace the shape of the entire piece of construction paper onto the sheet metal. Allen Coleman has been writing since 2002. He got his start with "Oregon Insider Sports" covering college athletics. Since then Coleman has had work published in "Tailgater Magazine," "PDX Magazine" and on several websites including Scout.com. He is currently on the radio in Portland, Oregon and writing his own scripts. Coleman studied communications at Concordia University and Southern Oregon State.